Cryochemistry is cool. No pun intended. Cold temperatures make matter do all kinds of interesting things. Amongst other things, noble gasses (once believed to be completely inert) can actually form compounds at low enough temperatures. It’s been known for a while now that Xenon can form several compounds, usually with fluorine (fluorine is a vicious little thing that’ll react with pretty much anything you give it). Xenic acid (H2XeO4) and perxenic acid (H2XeO6) are actually used in labs as oxidisers. Instead of contaminating a sensitive reaction, they just produce Xenon gas which bubbles away. 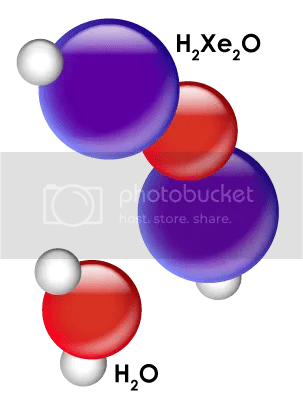 But this interested me… A bunch of chemists from Helsinki, lead by Leonid Khriachtchev, have managed to get Xenon to slip inbetween oxygen and hydrogen, making H2Xe2O. So that’s erm… dihydroxenic oxide? Or perhaps oxygen dihydroxenide? So how do you get a supposedly inert gas to perform such intimate chemistry? I won’t go into the fine details, but it involves some powerful UV light, which makes reactive free radicals (which are often just as vicious as that fluorine I was talking about). By using solid frozen xenon and water, you can make hydroxenoxyl radicals (HXeO•). Being an unstable radical, it will then happily go on and react with another Xenon atom and voila. H2Xe2O is actually very stable, though it decomposes at temperatures above 70K (just to compare, liquid nitrogen boils at 77K). Theoretically though, Khriachtchev believes that it could exist at 0°C. His group are working on explaining why there’s much less Xenon seen on Earth than there should be. One potential explanation for all that missing Xenon is that it’s trapped in the Earth as a mineral. Basically, take any silicate and subject it to the right conditions, and you could end up with silicon atoms being substituted by Xenon atoms. This was sugested (not by Khriachtchev) a few years ago. Not unfeasible, especially as silicates often have all sorts of unusual elements included in their structure. Personally, I reckon some amount is probably trapped in clathyrate ices and fullerenes too, but that’s just my own speculation on the matter. Interestingly, this group have also done the same thing with acetylene (a molecule currently rather close to my heart), making H-Xe-C≡C-Xe-H! I can only assume that a -XeH functional group would be called hydroxenide in organic chemistry. Perhaps coolest of all is the fact that chemicals like this could quite possibly occur naturally in the oort cloud and kuiper belt. Hydroxenides may even occur on some moons in the outer solar system. Logically, any excess xenon in the solar system that wasn’t mopped up by planets or moons would be blown to the outskirts by the solar wind. Once in the cold expanse of the oort cloud, xenon could easily condense onto any of the objects there. The Sun’s UV flux would be tiny by the time anything reached that far away, but chemical reactions in places like this, on the edge of the sun’s little bubble of space, are actually driven by the UV in starlight! This entry was posted in chemistry, Imported from Livejournal and tagged molecules. Bookmark the permalink.